Just a ‘for fun’ page, while I have been a bit behind on posting new journal pages, I’m still doing them:-) This page was started when my online class began and finished a couple of days ago. More work in my Moleskine journal. What a fun learning experience my first online class was, there is never a time like the first time! What a great page. Cool moon! And the flow of the journaling is the perfect touch. 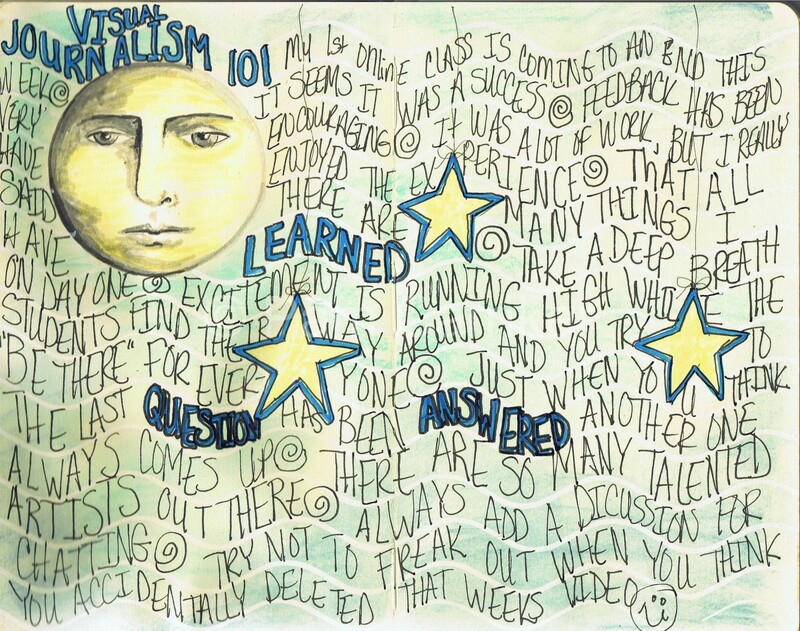 I love this, I loved your class – found the flickr page, doh! wow there is some amazing work on there all inspired by YOU – feel proud!Thanks for your comments on my blog, I was amazed at how the moleskine held up to, and that had acrylics, water, medium, stamps on it and didn’t curl at all! I really like the flow of the page! I want to start journaling, but am intimidated when I look at the blank pages. Pretty page. I like how the stars are hanging and how you made a path for your text.